In New York City businesses generate 9,000 tons of waste every day. To put that in perspective, that's roughly three-fifths as heavy as the entire Brooklyn Bridge (sans rush hour traffic)! Most of that garbage goes to landfill in New York and surrounding states. If we were better at our recycling game, we could divert all but 11% from the garbage heap. But why put in so much effort, and where do we even start? We totally get it - recycling can be confusing! Beyond just having good karma, there are several reasons why offices should recycle. In New York City the goal is to achieve zero waste by 2030 to protect our air and wildlife. To achieve that they've implemented several programs to make recycling easier. Along with the new programs, NYC has also implemented several regulations for those who don't comply, so avoiding a fine could be a great reason to start recycling. Creating a market for recyclables also helps to create jobs and stimulate the local economy. Recycling also contributes to healthier and cleaner cities and conserves natural resources for future generations. Do it for the kids! We made our own custom educational signage, but the Department of Sanitation will send you some! You can get yours here. Walk through your office and gather information - are you recycling already? Do you generate a ton of paper waste? Maybe you drink a lot of La Croix and have a lot of cans? Identify opportunities to increase recycling rates - a paper waste bin and recycling bin could address those problems! Install recycling bins adjacent to trash bins - make it easy to access and easy to do! Provide clear labels for all bins, and place signage above bins - make instructions clear. Install compost bins (if applicable) - maybe enlist someone in the office who's an avid gardener to help take charge. Here are a few reminders for every day items. Plastic Bags - it clogs the recycling machinery! That cardboard sleeve from your morning coffee cup. Milk and juice cartons - yep, even if they're the papery kind. Plastic utensils - small, but recyclable! Common office supplies: paper clips, folders, binders, etc. Contact your office manager for disposal of any specialty items, such as electronics and furniture. Questions? Comments? 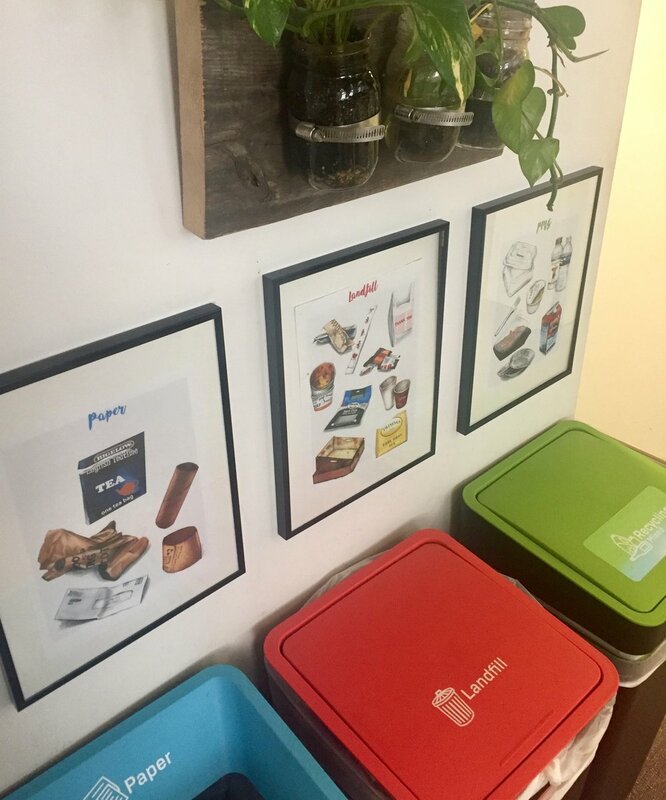 Want to share Your office recycling signage? Let us know!